The progress of East Bank Demerara Public Road widening works at Diamond is once again in the spotlight- this time, for the slothful rate of progress. This is interrupting the smooth flow of traffic. According to a government official, the Public Works Ministry is cognizant of the lengthy and fuel consuming wait commuters have either turning into Diamond Housing Scheme or heading to Grove. The road widening programme between Providence and Diamond was awarded to three contractors—Dipcon, GuyCo Construction and BK International. BK International is responsible for the Diamond section. One government official said that he has been far behind schedule for a long time. He was approached repeatedly by the Public Works Ministry’s Engineer and was told to complete the road leading into Diamond Housing Scheme. This failure is creating a mile-long traffic jam daily. One engineer said that most of the work should be undertaken at nights when there is little or no traffic. That is how the first stage of the East Bank four-lane highway was built. During peak hours, the workers would halt work to allow for the smooth flow of traffic. This is not being done by this contractor and traffic jams are the usual thing. No work is being done at nights so the project is lagging far behind schedule. According to the government official, the duo is pussyfooting with the task. In the interim, the heavy flow of traffic that traverses the East Bank Demerara Public Road and those that enter Diamond Housing Scheme are forced at different periods during the day to wait for almost 30 minutes in a possible mile long line. People who live in Diamond must leave their home two hours earlier to travel to Georgetown, no more than 15 minutes in the normal flow of traffic. A disgruntled commuter waiting to enter Diamond Housing Scheme yesterday told Kaieteur News that almost daily he has to travel to Diamond and is faced with a long line that is time and fuel consuming. The man said that he is aware that whenever construction works are ongoing there may be traffic jams but sometimes there is no machinery working on the road and there is still a long line. From observation, he concluded that the long line was created by the unfinished turning lane into Diamond. This should have been a priority. Instead of focusing on the whole construction the contractor should have given priority to the turning lane for a smooth flow of traffic. And even now, the section of the road that is being prepared for the additional two-lane has been awaiting top surface for quite some time. The official also stressed that the Ministry should have also patched the small and huge potholes on the existing roadway since it could cause accidents. “The road is already limited in space; then when you try to dodge from a pothole to save your vehicle you could drive into another vehicle. We deserve better than we are getting,” the man said. The Government Official made similar observations. According to the Official, the Ministry and the contractor only last week discussed the patching of the roadway from Diamond to Herstelling. BK International is tasked with widening the roadway from the ‘high-bridge’ at Demerara Distillers Limited (DDL) to Diamond/Grove Housing Schemes entrance. This project was delayed for several months last year because of the presence of utilities. 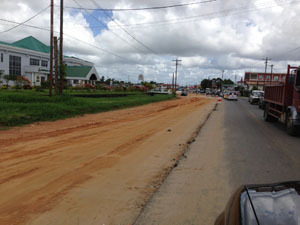 Guyana Water Inc. pipelines and conduits, Light and telephone poles in all the sections have been relocated. And, works only commenced on the project in March of 2013.